Aligning the right vehicle for the proper trip can sometimes prove challenging. A convertible is ideal for excursions to the beach, a crossover or a minivan is perfect for a long regional trip with the family while a big, burly crew cab pickup truck is the right model for taking to the mountains. Okay, a large sedan would also do, but who is complaining? Under the Bridal Veil Falls near Highland, NC. And to the mountains is where my family headed soon after a 2013 Ram 1500 Laramie Longhorn Crew Cab 4×4 (Laramie Longhorn) pickup truck was dropped off for a recent weekly drive. The trucks model name is as long as this vehicle is imposing, a massive full-size pickup truck powered by a HEMI engine and offering bountiful goodies galore. Those goodies ranged from the engineering: an eight-speed ZF-supplied automatic transmission; to the technical: a UConnect infotainment system; to the nifty: a pair of lockable side bed storage compartments (RamBox Cargo Management System). No matter how you look at it the Laramie Longhorn is a truck that is as big on style as it is on its proportions, offering a western-themed interior and the accompanying hammered silver badging to set this vehicle on top of the Ram 1500 pack. The trip itself started in the Raleigh area and headed west than southwest along I-40 before we found ourselves on the local roads of Macon County, NC. Our destination was Franklin, a small town that I had last visited 22 years earlier when I was unattached, childless and living in Charleston, SC. Its a mountain community that had long been etched in my memory bank, one that seem to beckon me to return. Over the arch of time many thoughts about Franklin, Highlands, gem stones and waterfalls crossed my mind, but this time I had a wife and children with me. Yes, I wanted them to experience what was stored in my mind, not fully expecting to find that the area remained unchanged, rather anticipating that the good elements were probably still in place. Those elements included gem mining, something that held little interest to the one-time single me, but as a dad with a pair of rock-loving boys in tow and a wife clearly interested in sharing this experience with them, stops at both a local mine and a gem museum were in order. To get there, we needed to travel along a narrow and winding road that lifted, dipped and twisted its way from Franklin to Highlands. Along the way we took in several sites including three waterfalls: Cullasaja Falls, Dry Falls and Bridal Veil Falls, the latter allowing us to park the Laramie Longhorn underneath to shoot some pictures and enjoy the beauty of God’s handiwork. 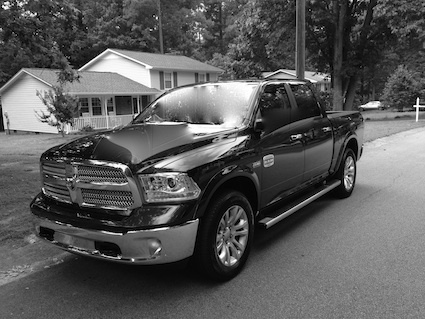 The Laramie Longhorn itself represents the top-of-the-line model in the Ram 1500 line. Its price starts in the high 40s and pushes to the mid 50s when fully equipped. That fully equipped model kept us in comfort on and off the road, a 44 that blends the attributes of a luxury sedan with a workhorse truck. lients. Thats an apt description, because if you are worried about messing up the interior, then the leather clad seating, burl wood trim and other niceties might suffer under heavy duty work crew use. Yet, the Laramie Longhorn offers an example of what the Chrysler Group can serve up despite not having a true luxury brand to offer. This model features heated and ventilated front seats, heated rear seats, zoned climate control, a UConnect infotainment system that is easy to use, an adjustable instrument panel with ringed dials and electronic read outs, power accessories including a moon roof and a sliding rear window, an Alpine sound system and numerous storage compartments. You can spend hours poring over this truck to discover its many amenities including some that are hidden away like the rear under seat floor storage compartment. On the road, the Laramie Longhorn can be operated as a 42 model or drivers can select automatic or lockable 44 driving modes. Chrysler set this system up to shift on the fly, ideal when you suddenly encounter road conditions that warrant a quick change. We had a few of those where we had to pull off the road, make a sharp u-turn and head back to a spot that we sailed past just moments ago. No need to wait for a smooth surface as this truck, outfitted with Goodyear off-road tires and 20-inch wheels, can tackle the toughest terrain. 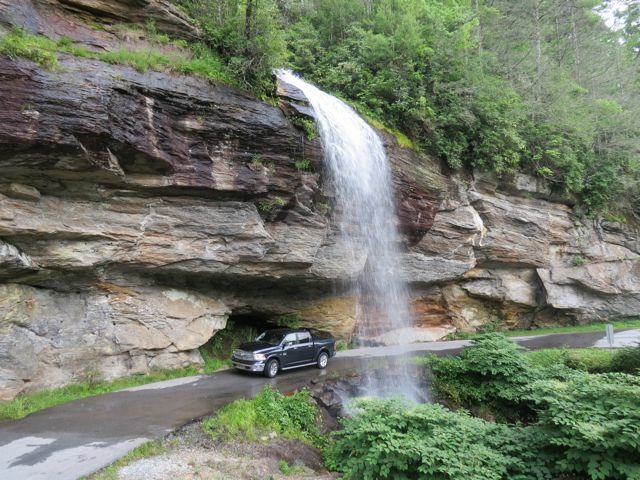 Nantahala National Forest can best be enjoyed by traveling along Route 64 between Franklin and Highlands. Its an 18-mile trip that will take you about 30 minutes, but you should allow two to three hours if you want to take in the scenery. This road features several pull overs including places for picnicking, stops for viewing the falls and even gem mining. Dry Falls is perhaps the most stunning of the three main waterfalls in the area and offers parking spaces for about two dozen vehicles. In drier conditions, the water gently flows in several streams over the hanging 65-foot bluff, thus its name. We were fortunate as the area had recently experienced heavy rains the falls were anything but dry, offering a singular and unstoppable torrent of white water. Despite the heavy flow, we were still able to walk underneath the falls and enjoy the cool mist that nearly chilled us. Ah, what a difference local weather conditions can make: temperatures at the falls were in the mid 60s while back home the heat was on. We could get used to this…. 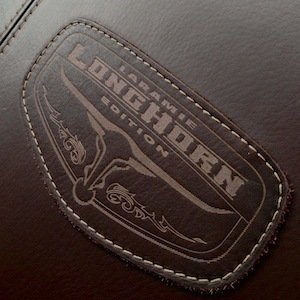 The Laramie Longhorn is powered by a 5.7-liter HEMI V-8 engine, that makes 395 horsepower and 407 foot-pounds of torque. It isn’t the largest HEMI in Chryslers arsenal, a 6.4-liter engine is, but it offers sufficient power without complaint. It does this mated to an automatic transmission, tackling 8-degree inclines with ease. Im not sure why some 18-wheelers insist on staying in the left lane while navigating the toughest roads, but when they finally got the hint that a Ram was on their tale, the truckers moved over and we effortlessly sailed by. The EPA rates the big Ram 1500 at 15 mpg in the city and 21 mpg on the highway. Our best mileage average was 19.4 miles to the gallon, but we did not complain. With four people in the cabin and the attendant long weekend luggage also in place, this pickup had to carry more than 6,500 pounds of people and machine weight. The same Texas transplant neighbor was impressed by the fuel mileage, noting that her similar 2005 Dodge Ram 1500 averaged just 15 mpg on a recent trip back home. Despite the pretty appellation given to the Ram 1500, my family was impressed that the truck was a four-wheel drive dynamo, able to do a number of tasks less capable vehicles should best avoid. Given that our time with the Laramie Longhorn was limited, we couldn’t try out the front bumper tow hooks or connect our vacationing neighbors Moomba Outback. We thought about filling up the storage boxes with ice and drinks, but chose to use these for luggage storage instead. Yes, you can really carry dozens of cold drinks safely in the sides of your truck bed. Imagine the possibilities…. 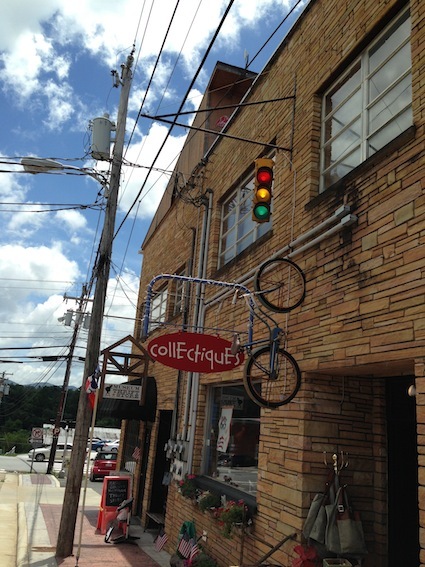 Downtown Franklin exudes a charm that is typical of many long ago established southern communities. That downtown was in place before the War of Succession, with the county jail opened since 1850. The eight-room jail served Macon County for 122 years before a new complex was built around the corner and across the street from the original jail house. A year before the prison closed, the forerunners of The Gem and Mineral Society of Franklin, NC, Inc., began to meet and since 1974 have been the loan occupants of the old jail house. Today, every room, nook and cranny of the museum is filled with colorful and sparkling rocks, not just from North Carolina, but from across the United States, indeed from around the globe. The weight of the gems that we brought back with us were less than five pounds and I had to keep to myself simmering dark thoughts of heisting one section of a three-part beryl aquamarine stone and hiding it underneath the Rams tonneau cover. Its 346.5-pound heftiness quickly dispelled those notions as did unpleasant thoughts of spending hard time in a pokey where human and mineral history converge. EPA: 15 mpg city, 21 mpg hwy.